Like the sinkhole that swallowed eight historic Corvette examples in its awesome, earthy maw, this tree solidifies that sometimes, nature can be a cruel and callous adversary to unsuspecting classic cars. 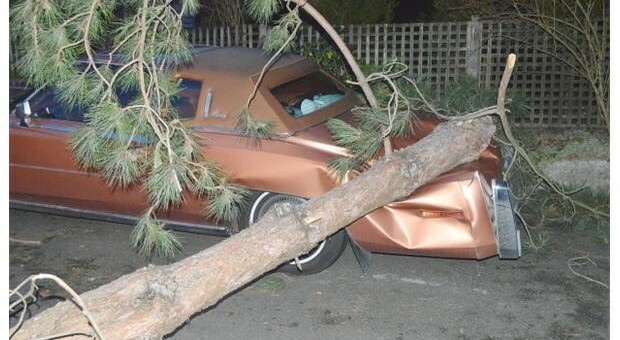 The Province wrote a story about this two-owner, 1977 Cadillac Eldorado Biarritz coupe which was inadvertently lowered when a tree blew over, falling onto the trunk. The car had a single owner through its entire life until last year, when it was purchased by one Lyndon Throness, a classic Cadillac enthusiast. While this Eldorado was used to being coddled – polished regularly, covered from every rainfall – Throness parked his $5,500 classic outside of his home in Surrey, to satisfy passersby who might like to see the immaculate automobile. But then, wind happened, and a massive Ponderosa pine was snapped like so much kindling, tumbling onto the Eldorado’s trunk. The rear window was completely smashed. Said Lyndon Throness: “We woke up to a mighty crash. I don’t think it’s fixable.” While enough money can fix anything in theory, we may have to agree with him. This case of nature vs. car is especially tragic since the Cadillac’s color – “Firemist Orange” – is a true rarity. But despite the car’s damage, Throness still drives it regularly. “It drives beautifully,” he says. Sadly, earlier this winter, behind our house two streets over, a mid ’70’s Coupe de Ville, light blue/white, with a diesel conversion no less, was lost when the garage burned down. Very good condition reduced to a burned out shell. I hope he gets the Eldorado fixed, would be a shame not to.